Koyasan (高野山) is the most sacred mountain in Japan. It is the holy land of Shingon Buddhism established by Priest Kukai in 816. It has the history of over 1,200 years that has been carried over with all the tradition, ritual and history from Priest Kukai. There are about 117 temples and as the top of all Shingon Buddhism temples, Kongobuji takes a place of all the center. 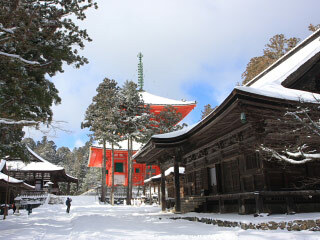 Because of this rich history and tradition, Koyasan is registered as the UNESCO World Heritage Site. There are many parking and restroom. In winter, this mountain get so cold. 1. use local bus to Kongobujimae. Koyasan is a basin on a mountan 820m above the sea level. It was granted to Priest Kukai as a place of meditation by the imperial court 1,200 years ago. Practitioners at Koyasan endeayour to idntify themselves with the BUddha by spiritual unification. Priest Kukai sent his disciples to explore Koyasan since 816. They cleared the precinet called Danjo on Mt. Koyasan. He planned to established not only a monastery. Shrines of guardian divinities, but a grand stupa. But it was extremely diffie it. Monastery Chuin was the residence of Priest Kukai and his disciples. Kongobuji temple is the head temple of Shingon Buddhism located on Mt. Koya. It was established in 816 by Priest Kukai who brought Mikkyo, Vajrayana to Japan. Priest Kukai studied Mikkyo in China and came back to Japan in 806. He was given the land of Koyasan from Emperor Saga and established the temple. Kongobuji was used to be the name of all Koyasan named by Priest Kukao. In 1869, two temple unified and became Kongobuji as the head of Shingon Buddhism. Danjo Garan, or Dai Garan is the part of Kongobuji in Mt. Koya, Wakayama prefecture. In 816, priest Kukai established Mt. Koya and his temple here. Dai Garan has served as the focal point of the study, training and rituals of Shingon Buddhist Monks. Priest Kukai made Koyasan as a place for meditation far from worldly distractions. There are many historical buildings and the Buddhist ritual and ceremonies are held in this place for over thousand years. Those buildings are lost and reconstructed again and again to keep the flow of the Buddhism. Dai Garan is one of the most sacred place in Koyasan. The Mausoleum of Kobo Daishi Kukai is the most sacred place in Mt. Koya. In 835, Priest Kukai started to taking eternal meditation in this Oku no in. On the worshipping pass, there are many memorial graves of Daimyo and lords of the domain. The entire site is designated as the UNESCO World Heritage Site. People pray to their ancestors for their peace. Daimon is the Main gate of Koyasan. It is the large red gate with Nio Statues constructed in 1705. The size of the gate is 25m tall and 21m wide and 8m deep. It is registered as the national important cultural assets. It has a beautiful sunset scenery. The mausoleums of Tokugawa Clan was built by the 3rd Tokugawa Shogun Iemitsu. There are two mausoleums, one for 1st Tokugawa Shogun, Ieyasu, and other is 2nd Tokugawa Shogun Hidetada. They are constructed in 1643. The buildings are common structures of Edo period.